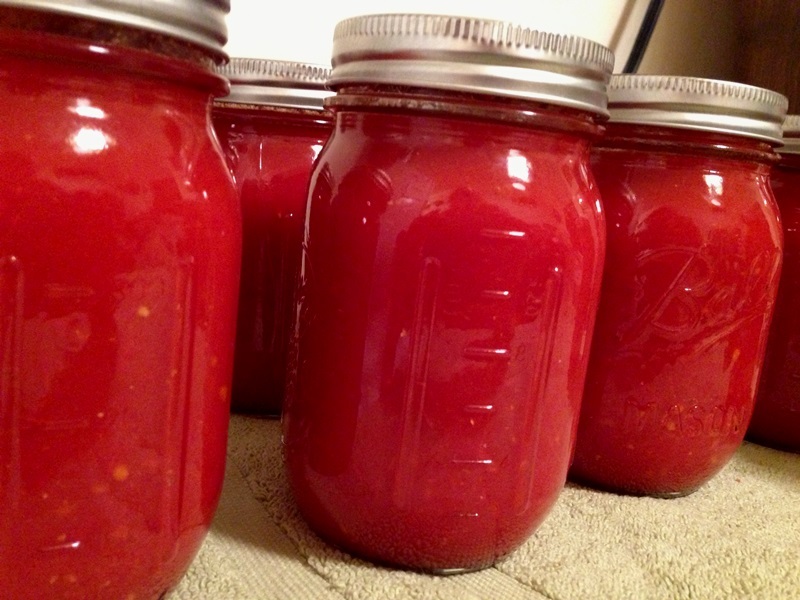 There’s actually nothing wrong with canning tomatoes with their skin. Unlike peach skin, that potentially increases the risk of bacteria, tomato skins are good. They contain natural pectin, add body and flavor the a sauce. Removing them is more of a cosmetic/texture thing. Tomato skin, even after boiled down for what seems like forever, tends to remain stringy. Nothing ruins a rich delicious sauce more than a tough string of tomato skin. However there is a way to use most of those skins and yield extra sauce! I worked off my standard marinara sauce recipe, just rewrote the instructions a bit. 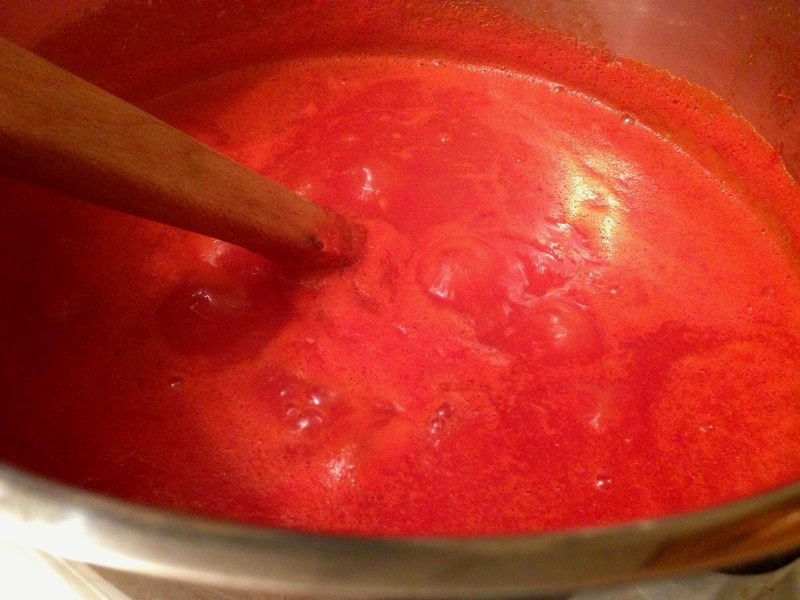 Cook the tomatoes until extra soft, close to 45 minutes. Then the secret step? Puree the sauce. It will break down most of the stringiness of the skins and leave you with extra bulk for your sauce. Push the pureed mixture through the fine plate of a food mill or sieve, then continue cooking. Rather than losing close to 2 cups of skin, you lose less than 1/2 a cup. Plus, the sauce finished in a couple of hours, rather than last year’s 4-5 hour tomato battle. Heat oil in a VERY large pot over high heat. Add onion, garlic, salt and saute until onions are translucent, about 5-6 minutes. Add tomatoes, increase heat and bring to a boil. Reduce and simmer for 45 minutes until tomatoes have broken down and onions are very soft. Using an immersion blender, puree sauce then pass through a fine bladed food mill or mesh sieve to remove leftover skins. Return sauce to pot and simmer until thickens and reduces by about a third, about 1 hour. Prepare clean, hot pint jars. Add 1 tablespoon bottled lemon juice to each jar then ladle in sauce, leaving 1/2 inch headspace. Wipe rims, apply lids and rims. Process for 35 minutes in a boiling water bath. I do but hadn’t seen that yet. Thanks for the tip!